A couple years ago, at a family bar mitzvah in Florida, my wife suggested I talk to Raquel, her aunt's sister, about her tattoos. Raquel, an attorney in Puerto Rico, was kind enough to let me take some photos and tell me about her work. 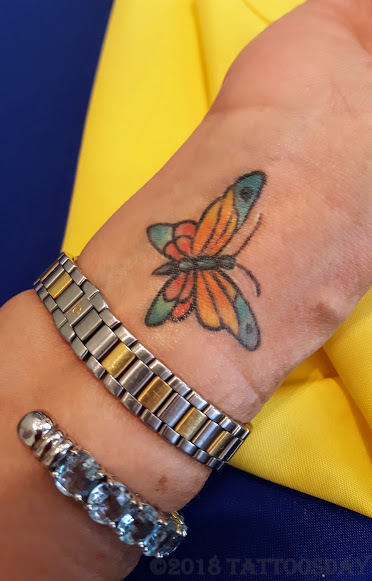 "I always wanted to have a butterfly. So, recently, maybe a year and a half ago, probably maybe less, I don't know. So, I was feeling sick, I was, you know I'm a lawyer, so I was in a seminar, and I was feeling really bad, so I had to leave the seminar and on the way to my home, I guess I felt a little bit better and I remembered I wanted a tattoo, so I stopped at this fancy place in San Juan that I know that did tattoo, and it was the same place, so I went to that place to have my butterfly done and then I went home and, later on, at nighttime, I felt really worse, so they had to take me to Emergency, to the hospital, and I was in the hospital for two days, so when I was in the hospital, I had this tattoo, tried to cover it, because I felt kind of stupid that, you know, being so sick, doing a tattoo on my hand and I didn't even want to tell the doctor or the person who took me to the hospital, that I had this tattoo done, so I had it covered ... so embarrassed that, here I'm so sick and that I got the tattoo, that's the story of my butterfly. 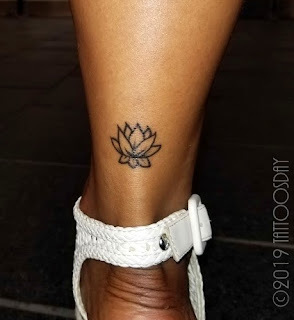 The thing is that, when I went for that tattoo, I kept telling the guy, here is an old lady doing tattoos ... he says, "it's okay, old ladies also need tattoos!" Muchas gracias to Raquel for sharing her two tattoos with us here on Tattoosday! Unfortunately, the front part of the skull is blurry, but you can really tell from the photo on the left what a great tattoo this is. It was a busy Sunday in Wegman's, so we didn't have much time to chat, but the post sat under the misleading moniker "Rosie the Dead Riveter," because the bandana on the skull reminded me of the famous "We Can Do It" poster from the World War II era. I do know from my notes that Adele is a truck driver and loves skulls, and that the artist is Thom Boyle (@tattoofrenzy) from Tattoo Frenzy in Amityville, New York. Thanks to Adele for sharing her tattoo with us here on Tattoosday! 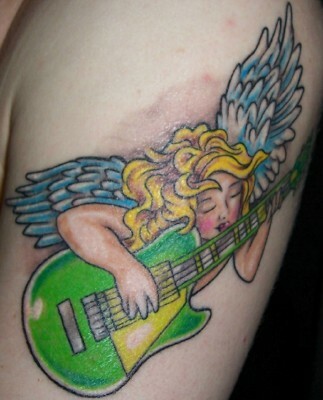 This post appeared originally back in May, 2011, but is worth revisiting on Tattoosday today! I spotted this at the now-defunct NYC Tattoo Convention at the sadly-departed Roseland Ballroom. 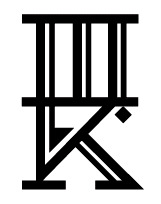 This entry is ©2011, 2019 Tattoosday. The fire on the left leg is credited to artist Sarah Gaugler (@sarahgaugler) from Snow Tattoo in Manhattan and the lotus on the right is by Hugo Andres (@xallitic_tattoos) from Xallitic Tattoos in Bushwick. "[The lotus] is all about the attachment to negativity and staying grounded ... the lotus flower is at the bottom of the water and when they come up every morning out of the water, they break free of all the dirt and often live in very swampy areas ... [The fire represents] a light that's burning inside ... in the yogic philosophy ... you pay attention to your light and do things and move in a way that brightens your light ... it's a reminder to focus on my light and meditate more ... also, passion, the fire inside, heat, essentially." Thanks to Natalie for sharing these awesome tattoos with us here on Tattoosday! Avii credited tattoo artist Seth (@paralysis.or.death) from Kartel Studio in Crown Heights, Brooklyn. She said he had posted this flash and told me "I'm game for whatever, as long as I like what I see." 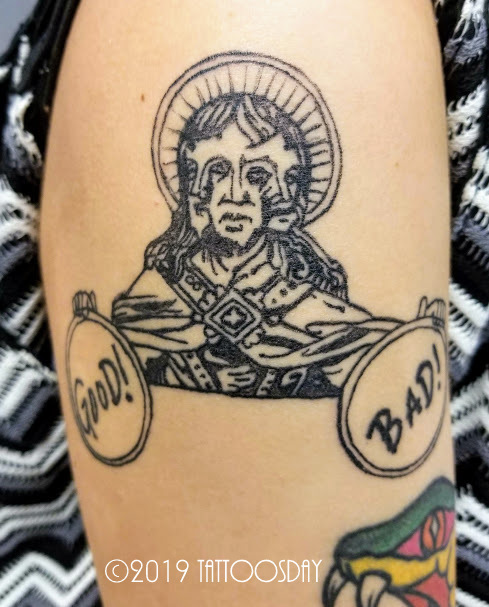 She noted that this design is based on 15th century art, depicting the Holy Trinity - the Father, Son, and Holy Ghost "as one person, driving out judgments." Thanks to Avii for sharing her cool tattoo with us here on Tattoosday! 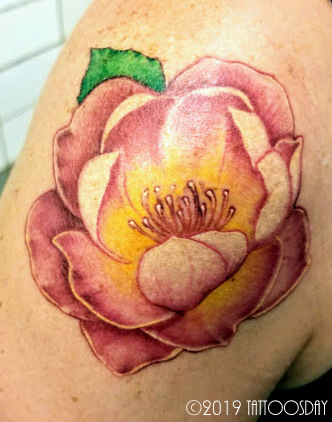 We only spoke briefly, but Sandra explained that she wanted a flower that was somewhat "non-traditional," adding that it reminded her a little of a Rose of Sharon, which makes sense, as a rose of Sharon is often attributed to different flowers, and this one recalls several types. She credited the work to Jon Jon (@jonjontattoo) from Triple Diamond Tattoo (@triplediamondtattoo) in the Gowanus section of Brooklyn. 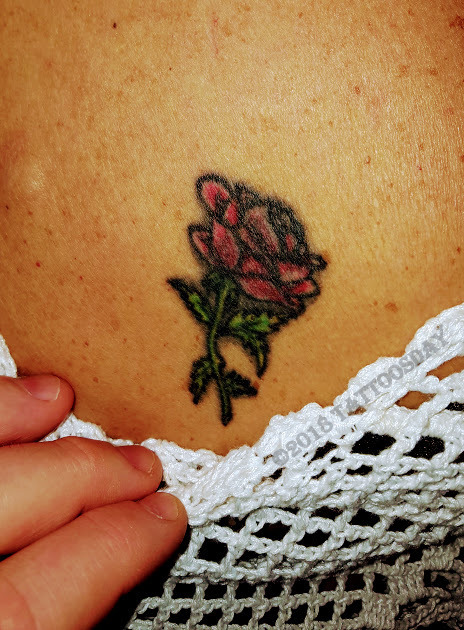 Thanks to Sandra for sharing this lovely flower with us here on Tattoosday! Amy, who is from the United Kingdom, explained that she got this on her 21st birthday, along with her sister. "When we were younger," she explained, "we used to horse ride." They got the matching horseshoe tattoos "for good luck for both of us," she noted. 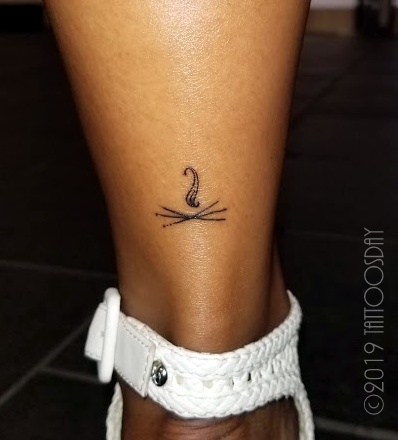 The lucky little tattoo was tattooed at Kids Love Ink (@kidsloveink_london) in the Deptford district of southeast London. 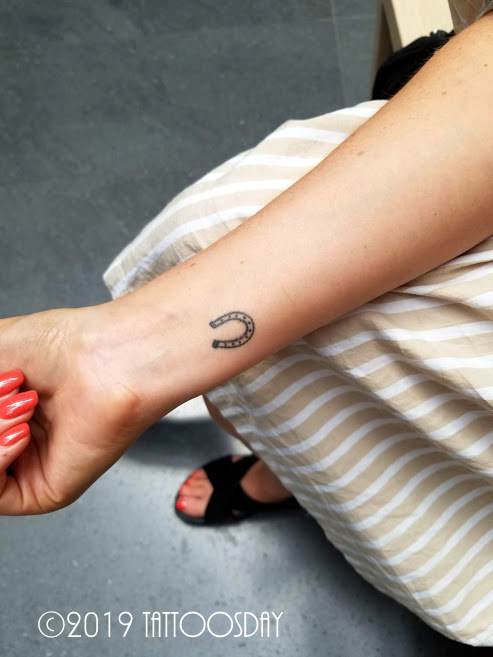 Thanks to Amy for sharing her lucky horseshoe with us here on Tattoosday!